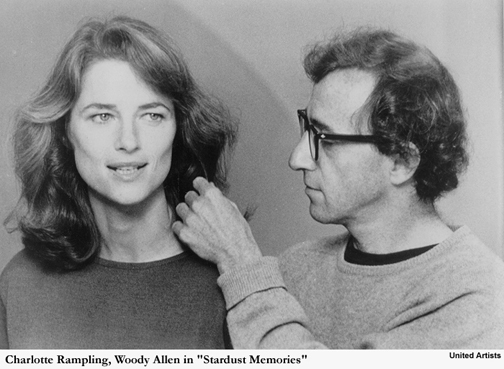 Released in 1980 to less than stellar box-office, even by Woody Allen standards, "Stardust Memories" is, nonetheless, a remarkable and beautiful film, and thrilling to see on DVD. It's almost too much to see and think about for even hard-core Smart Woody fans, and not slap-sticky funny often enough for the Funny Woody fans. It takes a certain amount of attention and intelligence to appreciate, which reduces its potential fan base to a smidgen of the population. But it is a rare gem, and worthy of taking time to see it slowly and think it through  an easier process with DVD, which allows viewers to easily go back or forward, or freeze an image for consideration. DVD also makes the most  for the small screen  of Gordon Willis' black-and-white cinematography, which is diamond-like in its clarity and somehow helps this at-times-painful story cut through to the heart. 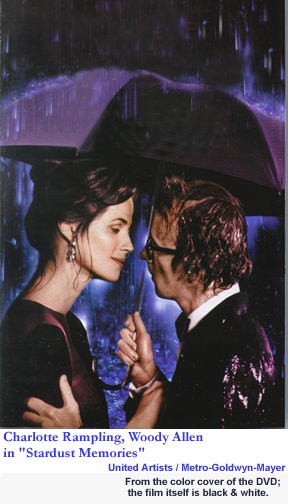 It is, on the surface, the story of a filmmaker, Sandy Bates (Woody Allen) who is at an emotionally difficult time in his career; he became famous making funny films, and now he wants to make serious films, because of all the pain and suffering he sees in the world around him. 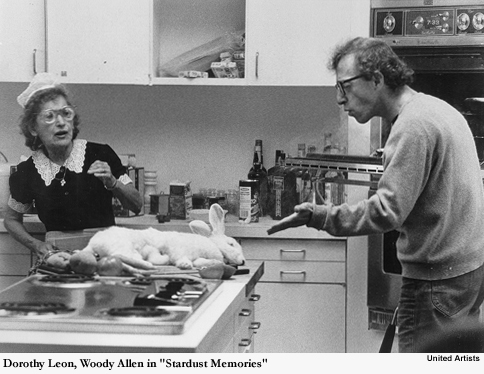 He gets resistance in such serious efforts from both his studio and from his fans, who like his "early, funny films." This is, of course, familiar in at least two ways: It seems suspiciously like the life of Woody Allen himself; and it smacks resoundingly of "Sullivan's Travels," the great 1942 film by Preston Sturges wherein Joel McCrea plays a comedy filmmaker leading a privileged life who decides to hit the road and try living among the pain and suffering. His revelation comes when he is thrown in prison with some hard and sad men, and ends up watching a Disney cartoon with them. He sees their mortal burdens lifted by laughter, and realizes he has helped the world by making silly films himself. Sandy: Why is there so much human suffering? Sandy: Is there a God? Aliens: These are the wrong questions! Sandy: Look, here's my point. If nothing lasts, why am I bothering to make films or do anything for that matter? Aliens: We enjoy your films! Particularly the early, funny ones. Sandy: But the human condition is so discouraging! Aliens: There are some nice moments, too. Sandy: Shouldn't I stop making movies and do something that counts, like, like helping blind people or becoming a missionary or something? Aliens: Let me tell you: You're not the missionary type. You'd never last. And, incidentally, you're not Superman. You're a comedian. You want to do mankind a real service? Tell funnier jokes! "That relationship with Dorrie" is a magnificiently told thread of this film, which is a complex tapestry. Dorrie is played by Charlotte Rampling, and the way Rampling the actor and Allen the filmmaker work together to tell this story is like watching a great soloist and a great conductor making brilliant music together. Dorrie's story with Sandy is a sad one, colored by her neurotic, drugs-managed existence and, apparently, infidelities on his part, and maybe on hers. The standing lore about her is she is great for two days a month. The other 28 are a nightmare. Sandy: They're putting something wonderful in your lithium. Dorrie: I stopped taking lithium. Sandy: Oh, Jesus! You're kidding! Dorrie, that's not a good idea! You can't just go on and off it like that! Dorrie: I don't think it does much good. And neither, apparently, does her relationship with Sandy, and indeed, the story of Dorrie here is mostly Sandy trying to figure it out afterward  while he is also considering having a committed relationship with Isabel (played with Earth-mother beauty and charm by Marie-Christine Barrault) and flirting heavily with an intriguing but troubled musican (a fine characterization by Jessica Harper). In telling the story of what happened to Dorrie, Allen and Rampling create one of the most beautiful and powerful emotional scenes I've ever seen in a movie, using a filmic device. Almost all directors shoot plenty of "coverage" of most scenes  that is, they shoot the same scene again and again. Maybe from different angles, or maybe from the same angle again and again just to give the actor many chances at getting it right. In "Stardust Memories," Allen  with the help of Willis and editor Susan E. Morse  strings together take after take of Dorrie telling Sandy she is going to be with another man, one who cares for her and makes her happy. But, she also asks him if he is seeing someone. "There's a doctor here who thinks I'm beautiful and interesting," she tells him again and again, and then, "Are you seeing someone? You look thin." Then, she thinks, and thinks, and fiddles with her hair. "You were always searching for the perfect woman. You wound up falling in love with me." Even with some of the same dialogue repeated, the scene builds and builds because of Rampling's performance. Dorrie's internal agony screams to be seen, and is. It is powerful and moving on every level. 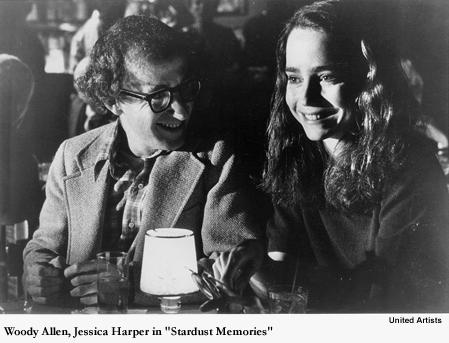 There is another scene that works even more simply: Sandy's favorite moment with Dorrie. He is eating something. Louie Armstrong's recording of "Stardust" is playing. A nice day inside, a light breeze blowing, and Dorrie is beautiful, reading something. He just stares at her. She looks up, see him watching her, and smiles with love. He keeps watching her, and Rampling takes Dorrie wordlessly through a full course of emotion, including love and insecurity. It is beautiful, bravura filmmaking, and reminds me of a line from a Paul Simon song: "Losing love is like window in your heart  everyone sees you're torn apart." The DVD includes both wide-screen and pan-and-scan versions, the theatrical trailer and a small, four-page pamphlet. There's plenty to laugh about in this film, too, but more to think about. The opening scene is telling and funny  Sandy Bates is stuck on a train full of morose and miserable people. The next train over, everyone is beautiful and having fun. Look for Sharon Stone in that scene: She blows him a kiss from the party train. Oh yeah ... the soundtrack is a delight. Besides Louis Armstrong, keep an ear out for Django Reinhardt. Great stuff. I would love to see this film on a big screen again, and hope some revival house near me shows it again sometime. In the meantime, the DVD is a delight. 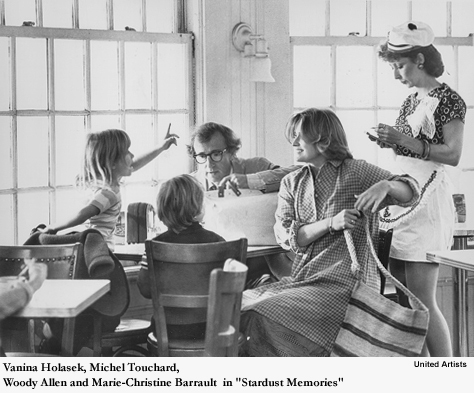 See cast, credit and other details about "Stardust Memories" at Internet Movie Data Base.